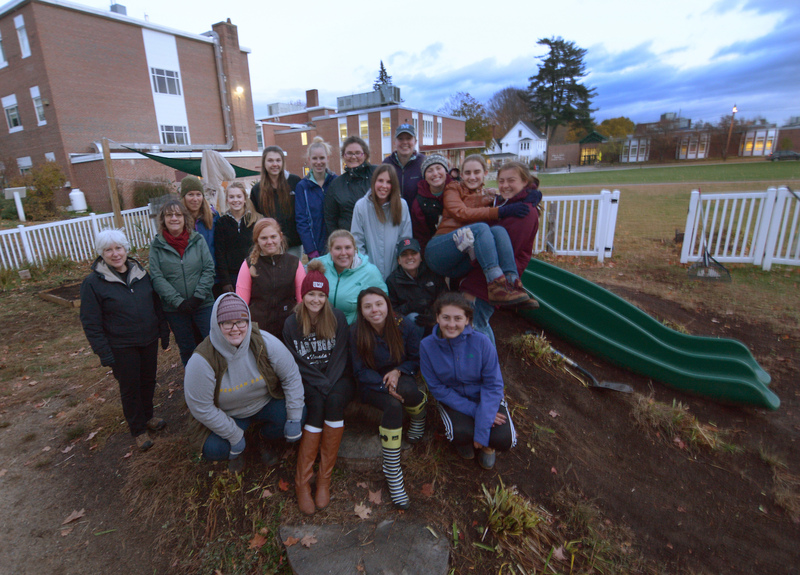 UMF students that participated in a workday to add nature elements around the Sweatt-Winter Childcare and Education Center. FARMINGTON – The Sweatt-Winter Childcare and Education Center on the University of Maine at Farmington campus is continuing to investigate new approaches to education, most recently utilizing a grant to add plantings and other outdoor elements to the center. Sweatt-Winter provides roughly three dozen children with childcare, while simultaneously serving as a classroom for future teachers and a research site for new childhood educational strategies. UMF education majors spend several hours a week at the center, getting an early introduction to how teachers operate in a classroom-like environment. "Practicum students observe and learn from what they see the teachers do in the classroom," Patti Bailie said. An assistant professor of early childhood education, Bailie is the faculty liaison for the Sweatt-Winter. 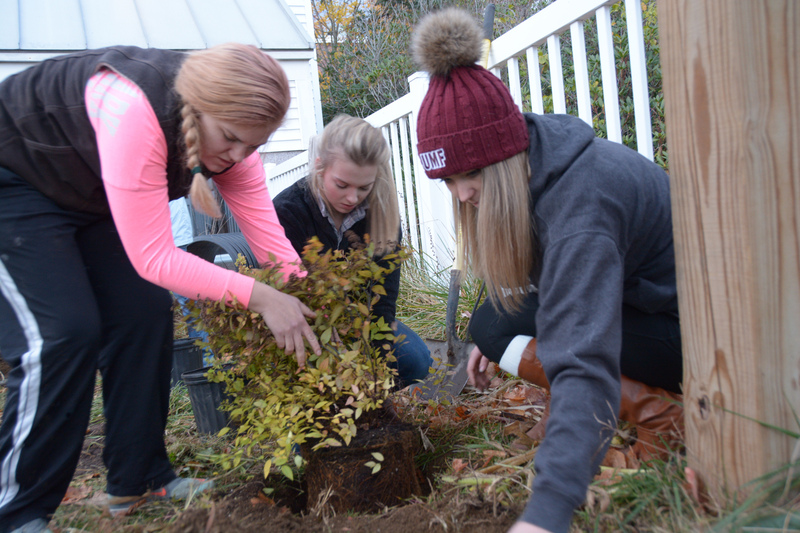 Students plant bushes near the center. Recently, the center received a pilot grant from the Kennebec Valley Community Action Program to add improvements that support nature-based education curriculum for the center's children. A new concept, nature-based education programs relate to the importance of connecting children to the natural world. “Many public schools are just beginning to provide this type of outdoor experience as an integral part of their curriculum,” said Bailie. "Connecting children to nature has many positive and lasting effects including on their attitudes, behaviors and environmental awareness." UMF is the first public liberal arts colleges to provide teacher training in this new approach. The $3,500 grant KVCAP grant purchased blueberry bushes and other plants, plastic culvert-style improvements that children can hide in and wheel barrows, rain coats and galoshes for students. 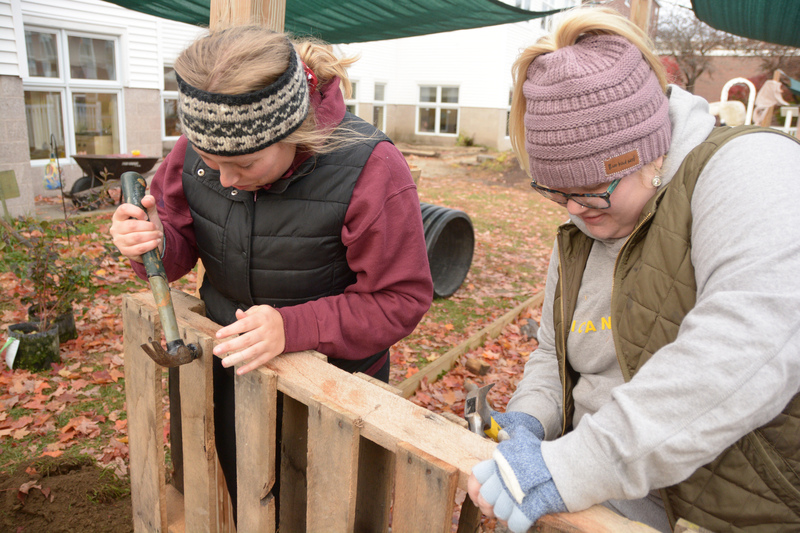 Additional improvements, such as the construction of playhouses out of pallets, helped augment the grant's impact at Sweatt-Winter. "KVCAP/Educare Central Maine values our longstanding partnership with the UMF Early Childhood program. We are excited about this unique opportunity with the Learning by Nature for ME initiative to reinforce our support of UMF and Sweatt-Winter and their commitment to the outdoors as a learning environment," said Tracye Fortin, KVCAP assistant director. The improvements were installed by UMF students during a workday. Bailie said that the center's children were excited the first time they saw the new additions. Sweatt-Winter has operated for more than 30 years in Farmington. There's typically a waiting list for kids to get into the program. The center will soon be seeing an expansion, however, thanks to the passage of Question 4 on Nov. 6. That bond will provide UMF with $8.5 million for a number of purposes, including an expansion of the Sweatt-Winter center. "It will really expand what we're doing over there," Bailie said. "It's more room, more kids and more opportunities for our students." Building pallet houses for children to play in.